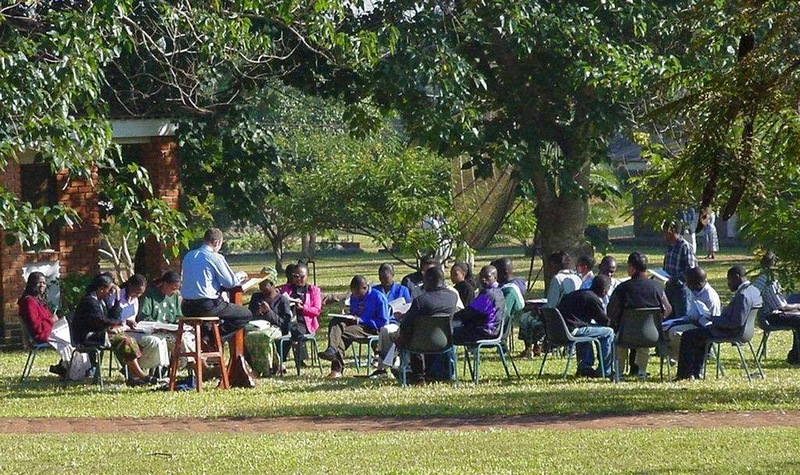 We've been asked why we are leaving the Bible College in Malawi where we’ve taught for the past 12 years. There are a variety of factors in our decision, but we continue to ask, ‘How can we help those laypersons that are doing the majority of teaching and preaching in the African Church?’ We have come to the conclusion that western-style educational institutions, while they have their role, are extremely limited in the African context. First of all, western educators typically teach using highly literate, analytical methods that are dependent upon the printed page. While most Africans, even highly educated Africans, often prefer to learn by ‘oral means’ such as storytelling. We need a method that those who either cannot read their own spoken language or prefer to learn by ‘oral means’ can understand. Secondly, a four year degree from a western-style educational institution requires a long commitment away from family, church and normal income. Moreover, the tuition an African student needs to get a four year degree is usually raised at great cost to the student's family or it requires a western donor. Thirdly, western-style educational institutions in Africa are almost always dependent on outside funding from western donors. When the western funding is reduced these institutions simply cannot sustain themselves. Moreover, if Africans want to reproduce such an educational institution they will first seek to attain western funding and western technology and then begin to build buildings. However, we can empower the laypersons who are doing the majority of the teaching and preaching in a way that does not create a western dependency! We are not offering titles, degrees, or scholarships. We are merely teaching a Christ-centered ‘Kingdom Biblical Theology’ using a set of Biblically accurate and orally reproducible stories. Moreover, we can do this in the ‘local church’ at no additional cost to those who are doing the preaching and teaching. Furthermore, we can do this without creating a western dependency. We plan to use our ‘Biblical Storytelling’ to launch story groups that can grow into an International Church that will reach students from various African countries attending the University of Stellenbosch in South Africa. Edwin Mwale, an ABC graduate, will serve as my Pastoral intern. Our funding is now through the African Christian Training Institute. ACTI , a legally recognized non-profit organization, has been in Africa 25 years. As an ordained minister in the Presbyterian Church in America, I am accountable to the Northwest Presbytery of the PCA and I'll be serving under the authority of the Reformed Evangelical Anglican Church in South Africa. Will you pray for us as we seek to fulfil the vision the Lord has given us for ministry in Africa? We plan to return to Africa in September and we need to build our team of ministry partners. We are seeking those who will commit to regularly pray for us and partner with us financially as the Lord leads. 1) That we can continue to build our team of ministry partners. We are seeking five (5) new partnering churches and twenty (20) new families or individuals who can give just over $1 a day. 2) For help as we move from where we've been staying in Woodinville, WA. We're moving to Redmond, WA (Aug. 1st) where we'll stay with friends until we leave for Africa in September. 3) That we will be granted the required permits and paperwork that we need to stay in South Africa for a few years. 4) For the emotional and spiritual health of our family as we go through these additional transitions. P O Box 15621; Panama City FL 32406-5621.